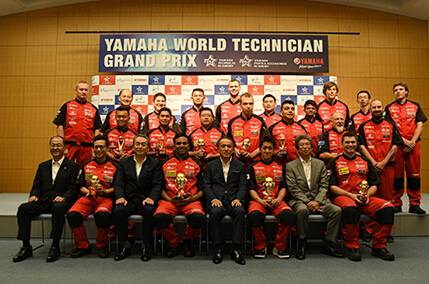 Mechanics from 21 Countries and Regions Compete for World Champion Title, Yamaha Motor Hosts YAMAHA World Technician GP 2016, Japan Wins Sports Model Class, with India Clinching Commuter Model Class - News Releases | Yamaha Motor Co., Ltd.
IWATA, October 13, 2016-Yamaha Motor Co., Ltd. (Tokyo: 7272) hosted on October 12 the 7th YAMAHA World Technician GP 2016. This competition featured 21 Yamaha motorcycle service technicians (mechanics from dealers and sales offices) selected from 21 countries and regions around the globe showcasing their best service techniques. Japan’s representative, Ryohei Samejima (YSP Kawasaki Chuo) won the sports model class, with India’s Jignesh Girishkumar Rana (PLANET AUTOMOBILES) taking out the commuter model class. The last time a Japanese technician won a category in this competition was 13 years ago, at the 2nd running of this event in 2003. The competition is split into two categories, Sports Model Class and Commuter Model Class, with rankings determined using an overall score across competition in three areas of service techniques. These are “Basic Maintenance Techniques,” demanding accuracy in fundamental maintenance such as tire changes, “Troubleshooting Techniques,” requiring correct diagnosis of problem causes and repair, and “Customer Service Techniques,” testing communication skills with the customer such as when explaining about repairs which have been carried out. Since 2000, the Company has promoted its unique global standard-based service technician training program YTA (Yamaha Technical Academy). The Academy aims to provide a consistent high-quality service at all Yamaha dealers worldwide, under the catch phrase One to One Service (expressing the concept of using professional service skills to create and strengthen the bonds with each and every customer). As of October 2016, there are approx. 33,000 YTA-certified technicians from 46 locations utilizing their skills in each country and region. “Well of course, I am just really happy. I have never been this nervous for anything before. It makes me feel so proud that I had the support from the chairman and president down through all the staff. Our branch is usually open every day, but they closed it for the day to come all this way to support me. Maybe I have met their great expectations by coming in first place. “I am very proud to have achieved second place in this great competition. Along with the training support from Yamaha Motor Canada, I am also very grateful for Yamaha Motor and everyone else for hosting an event like this. “I am very happy with third place; I wasn’t expecting anything like this. I am really looking forward to telling my co-workers of the result. “I am really happy. I would not have been able to get a result like this if I had not had the support from the staff at our shop, my friends, or my family. So many people helped with my training. I also had quite a lot of support from the owners who worked really hard to get my visa to come to Japan. Therefore I am really grateful to them, because without their help I would not be able to be here. “Well of course the major aim was to win, but I am extremely happy to get a trophy, which was another of my targets. I am very proud of my achievement here. This is because this is the first trophy that I have ever personally won, and the first trophy that Malaysian mechanics have won in the last 10 years of competing at these world championships. I am also very grateful for all the encouragement from the staff at Hong Leong Yamaha Motor Sdn. Bhd. right throughout these championships. In addition, I received significant support for special training from Hong Leong Yamaha. “I am extremely happy as I did not expect this at all. I am really very surprised. After becoming the Chinese champion, I worked towards preparing for this world championship every day through my job in inspection, maintenance, and customer service. “It is wonderful to receive such an award at these world championships. I am very moved by it all. I am also very grateful for all the support from everyone at Incolmotos Yamaha, the branch owner, and everyone else who helped me. The YZF-R3 that was used in competition is not that common in our region, so I had to do lots of practice at Incolmotos Yamaha. That turned out to be very beneficial for me. Thanks to everyone, I was able to come to Japan and give my very best in the competition. I want to take the knowledge that I have gained here back to Columbia, share it with my colleagues, and work at providing an even better service. This is because improving customer satisfaction is the “Revs your Heart” for us mechanics.